Brian E. Birdnow, PhD, is adjunct professor of history at Lindenwood University, St. Charles, MO. He has authored The St. Louis Five: Communism, Anti-Communism, and the Federal Courts in Missouri, 1852–1958 and Gerald R. Ford: The All-American President. Birdnow, Brian. 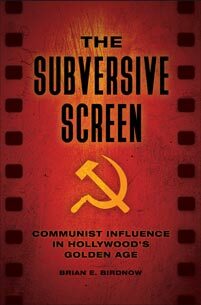 The Subversive Screen: Communist Influence in Hollywood's Golden Age. Praeger, 2019. ABC-CLIO, publisher.abc-clio.com/9781440849961. A riveting chronicle of Communist Party efforts to propagate Communism in the United States, concurrent with Hollywood's "Golden Age" of creativity that came to define classical Hollywood cinema.